Mister Maker will be crafting his way back to Melbourne this winter, and you are invited along to participate in the art party. The ultimate creative man synonymous for his spotted waistcoat, spiked hair, enthusiasm for making things in a minute, and the doodle drawer will appear live on stage with his friends The Shapes from 29 June to 1 July 2016. 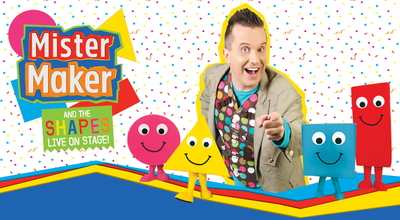 Following his sold out tour in 2015, Mister Maker returns Down Under with a brand new exciting show featuring new songs and live arts & crafts for your pre-schoolers to enjoy. As well as an action packed show featuring all the very best in arty adventures, Mister Maker invites you to participate in a 'big make' with the rest of the audience. Mister Maker's colourful all-singing, all-dancing supporting cast members Circle, Square, Rectangle and Triangle will enthuse and entertain your little people. Get inspired to craft with Mister Maker this winter. General admission tickets go on sale Friday 26 February 2016, and are expected to sell out fast. When: 29 & 30 June and 1 July 2016. 10am, 1pm & 4pm show times. Do you find Melbourne's changeable weather irritating?